At CSA in Nassau, we were privileged to award the Barbara Christian Prize to two joint winners. Our award focuses on recognizing books, which in the spirit of Barbara Christian, foreground intersectionality, national and transnational identities, feminisms, gender, sexuality, class and political movement in the twenty-first century. We were additionally interested in books that struck a balance between theory and activism, that envisaged a praxis of engagement. The books under review were all brilliant and we certainly had our work cut out for us. All books were reviewed on a 5 point scale using a rubric which measured: originality of research; unmistakable evidence of intersectionality; reliance upon theories that are not solely western, canonical, Eurocentric; Caribbean-American feminist/gender/queer analysis; and Barbara Christian’s legacy. This year we have two worthy winners who will share the prize- one in the spirit of methodological, and the other in the spirit of thematic, paradigm shifting – both in Barbara Christian’s spirit of praxis. 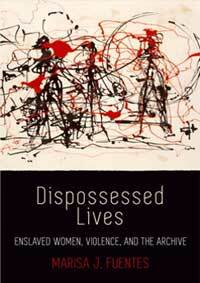 Dispossessed Lives: Enslaved Women, Violence, and the Archive, by Marisa J. Fuentes, published by the University of Pennsylvania Press (2016). 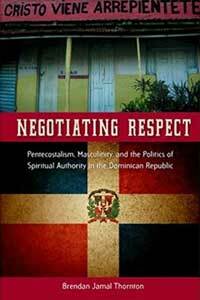 Negotiating Respect: Pentecostalism, Masculinity, and the Politics of Spiritual Authority in the Dominican Republic, by Brendan Jamal Thornton published by the UP of Florida (2016). One judge wrote: “I cannot assert strongly enough the groundbreaking moves made in Negotiating Respect. Thornton challenges our now settled critical orthodoxies as what counts as radical and subversive scholarship by taking seriously the diverse practices of Caribbean Christianity. Using the Dominican Republic as his case study, he explores how Pentecostalism is appropriated and localized in a local setting demonstrating the “dramatic variability” of Christian practices in a country framed as dominantly Catholic; and in scholarly traditions where “Protestant faith is ignored in favor of more “exotic” religions like Haitian vodou and Cuban santeria.” The stakes for the field of Caribbean studies are high. Thornton asks us to complicate our reading of quotidian religious practices: so, that we might see that “the church has become more norm than exception, more local than foreign, more orthodox than heterodox, more accepted than disdained.” Along these lines he leaves us with a provocative prompt—that “a study of Jamaican Pentecostalism would tell us more about Jamaicans and Jamaican culture than studying Rastafari religion.” (8). Dr. Barbara T. Christian dedicated her life to challenging oppressive ideas about race, gender, and class; she rejected the belief that critical theory emanated solely from the West and that African diasporic and Caribbean ways of theorizing were somehow inferior to Eurocentric philosophical concepts. A committed feminist, Barbara T. Christian pioneered the birth of black women’s literary criticism and theory. This award for the best book in the Humanities is in her honor and made possible by the generosity of Cora Christian, past president of CSA and Barbara’s sister, and of course the entire Christian family. I would like to thank Donette Francis, Sheri-Marie Harrison, Rosamond King, and Omise‘eke Tinsley who all served along with me, as judges this year. Honorable mention went to, Tanya Saunder’s Cuban Underground Hip Hop: Black Thoughts, Black Revolution, Black Modernity (University of Texas, 2015); and, Mark Schuller’s Humanitarian Aftershocks in Haiti (Rutgers UP, 2015). Congratulations again to both winners and to all of the authors who submitted their work. Finally, I have stepped down as Chair of the BC book prize- I was privileged to work for the past few years with the Christian family to resuscitate and relaunch the Barbara T Christian Book prize. I am now passing the baton to the capable hands of Professor Donette Francis. I am thrilled that we have again, an award which honors the important scholarly work being done in Caribbean humanities.